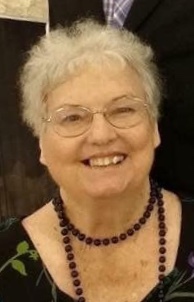 Nancy Kathryn Wood, 78, of Fargo, ND, and longtime Copperas Cove/Kempner area resident passed away on Wednesday, January 9, 2019, after battling health challenges for many years and entering hospice care at her residence in Pioneer House Assisted Living Center. Funeral Services will be held at 11:30 a.m., Friday, February 15, 2019, at Scotts Funeral Home, in Copperas Cove. Burial will follow the service in the Central Texas State Veterans Cemetery, Killeen, where Nancy will be laid to final rest with her loving husband Arlyn E. Wood, Sr. A visitation will be held from 5-6:30 pm, on Thursday, at Scott's Funeral Home of Copperas Cove with a rosary following. Nancy was born in Fort Smith, Arkansas, on March 24, 1940, to William and Lavina (Vernon) Center. She had one brother. After finishing schooling and a college program in Fort Smith, Nancy met Arlyn, who was stationed with the U.S. Army at Fort Chaffee, near Fort Smith. The couple married in 1962 and had two sons. The military lifestyle took Nancy and Arlyn to many assignments across Germany and the United States, including multiple tours at Fort Hood, Texas. Upon military retirement, they made their home in Kempner and were active members of Holy Family Catholic Church. Her main loves were her family and cooking. She was especially fond of being a loving “Nana” to her grandchildren. Nancy is preceded in death by her husband, parents, a step-mother, and her brother. She is survived by both sons, Arlyn E. Wood II, of Fort Lewis, Washington, and Gregory “Pat” (Jaime) Wood, Fargo, North Dakota. ; five grandchildren, one great-grandson; three sisters-in-law, Mae Clayton, of Tampa, Florida, Mildred (Wylie) Bailey, of Columbus, Mississippi, and Barbara (Jim) Hayes, of Alton, Missouri, and many nieces and nephews.